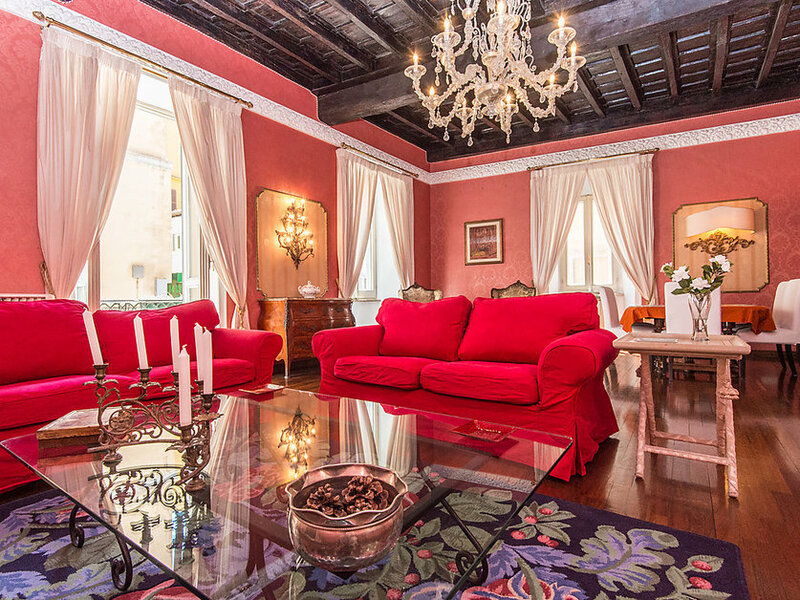 Historical apartment block “Spanish Steps Luxury”. In the centre of Roma, in the district Piazza di Spagna, in a central position. In the house: lift. Shop 50 m, restaurant 100 m, bar, bus stop 50 m, underground station “Spagna” 200 m. Located in one of the most prestigious and characteristics area of the city. Ideally placed to reach the Basilica of San Pietro and the Vatican museums. 5-room apartment 160 m2 on 1st floor. Luxurious and tasteful furnishings: large living/dining room with satellite TV, CD-player, hi-fi system and DVD. Exit to the balcony. 1 double bedroom. 1 small room with 1 bed. 1 double bedroom with shower/bidet/WC and TV. 1 double bedroom with shower/bidet/WC and TV. Large kitchen (oven, dishwasher, microwave, freezer) with dining table. 3 baths/bidet/WC. Heating, air-conditioning. Parquet floors. 2 small balconies. Facilities: Internet (WiFi, free). * Flight & car hire / transfers available as a supplement. Excursions available. A modern oasis nestled inside the heart of the Hollywood Hills, the Hollywood MidCentury Retreat offers its guests a welcoming and luxurious environment to enjoy their time in Los Angeles. Created with intention, the simple and sophisticated design and décor of the house epitomize a sense of Zen and serenity. The two-floor home boasts 2500 square feet with an exquisite view of both the rolling canyons and vibrant city below. The living area features floor to ceiling windows, providing an immense frame to the famous Hollywood sign and Griffith Observatory. A stainless steel fireplace sits at the center of the generously sized room, adding a cozy element to the contemporary layout. The bottom floor opens up to a private pool surrounded by a wooden deck and sleek outdoor furniture to accommodate up to twenty people. Enjoy an afternoon swim under the warm California sun, relax in the heated Jacuzzi, or grill out with the outdoor kitchen and barbecue. Featuring three spacious bedrooms and queen beds adorned in plush white comforters, the Hollywood MidCentury Retreat comfortably fits an entire family or group of friends planning their Los Angeles vacation. Each bedroom comes equipped with black out shades and private balconies, as well as a separate entrance for the master suite. Designed to promote an uncluttered mind, the house was built with ample closet space to suit your organizational needs. * Flight & car hire / transfers available as a supplement. Excursions available. Tucked away on a quiet street in one Hollywood’s oldest and most cherished enclaves–the Outpost Estates–this impressive, celebrity-owned architectural masterpiece offers complete privacy & sophistication. Famed Mid-century architect to the stars, Hal Levitt, made this home his personal residence for 40 years (1964-2004). Now it is available for you to make into a perfect Los Angeles retreat for your family or small group. Modern living awaits you in the tri-level patio featuring a sleek and dexterous turquoise pool, lounge chairs to soak up the sun, a BBQ grill, and cozy sitting area, all surrounded by lush green foliage and hills for optimal privacy. Stepping inside, massive windows allow light to penetrate every corner of the voluminous living room with a large TV and fireplace. The dining room is flooded with natural light coming in from all directions, including the glass ceiling and a sliding glass door, which opens to the patio. A beautifully redesigned kitchen, featuring Italian tile floors, also opens to the patio and encourages indoor/outdoor entertaining. The master bedroom sits quietly by itself on the first level, boasting a verdant and spacious master bathroom and stellar canyon views. Go upstairs to two generous guest bedrooms and two baths, each with unique perspectives. Downstairs you’ll find a gym/guest bedroom with its own bath. 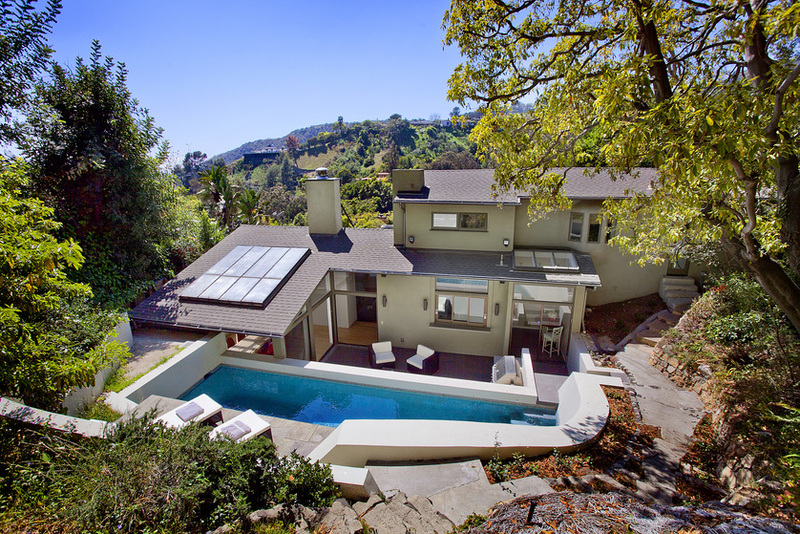 Exquisitely located in the hills just north of the Walk of Fame, Grauman’s Chinese Theater and all the attractions of Hollywood Blvd, you will be surrounded in nature but will be minutes away from the entertainment capital of the world. * Flight & car hire / transfers available as a supplement. Excursions available. “The mere mention of Bali evokes thoughts of a paradise. It’s more than a place; it’s a mood, an aspiration, a tropical state of mind” – Lonely Planet. The villa is located in the heart of the fashionable Seminyak district. It’s complimented by a stunning private pool surrounded by tropical plants, two spacious “Bales” (gazebos), one with comfortable sofas, the other with large day beds. You’ll be able to change easily between the sun of the pool to the air-conditioned rooms of the villa through the large glass folding doors which direct you into the living / dining room. All five bedrooms are air-conditioned, and the two front bedrooms have windows and glass doors opening up to the garden and swimming pool. All bedrooms have king-size beds and an additional day bed. The en-suite bathrooms of the four bedrooms facing the swimming pool have sinks and soaking bath tubs, the other one en-suite bathrooms have only sink and showers This villa is a perfect retreat for those who appreciate informality and total privacy but want to be close to Bali’s best restaurants, shops and beaches (just a 15-minute walk to the latter). 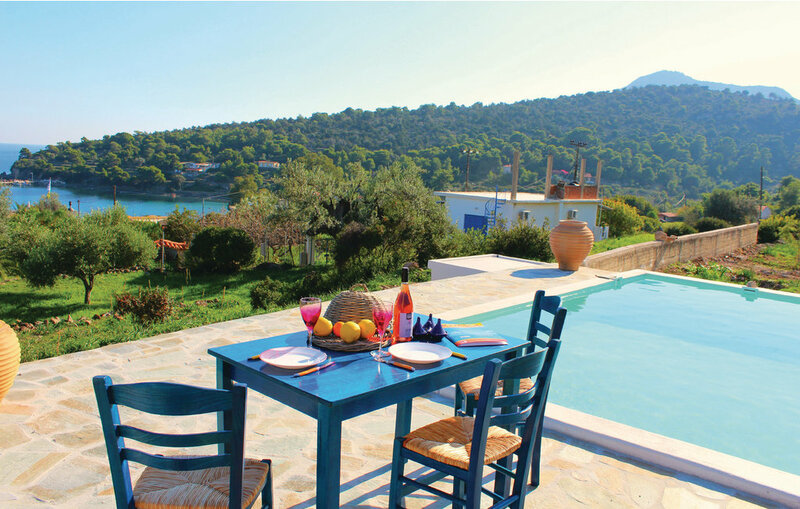 Just 500 metres from the sea, this characterful holiday home located in the The Peloponnese region of Greece with beautiful shared pool and 2 bedrooms for 5 guests enjoys a peaceful location amidst the olive groves. With prices from just £25pppnt (accommodation only), you’ll want to enquire today. Flights & care hire available. 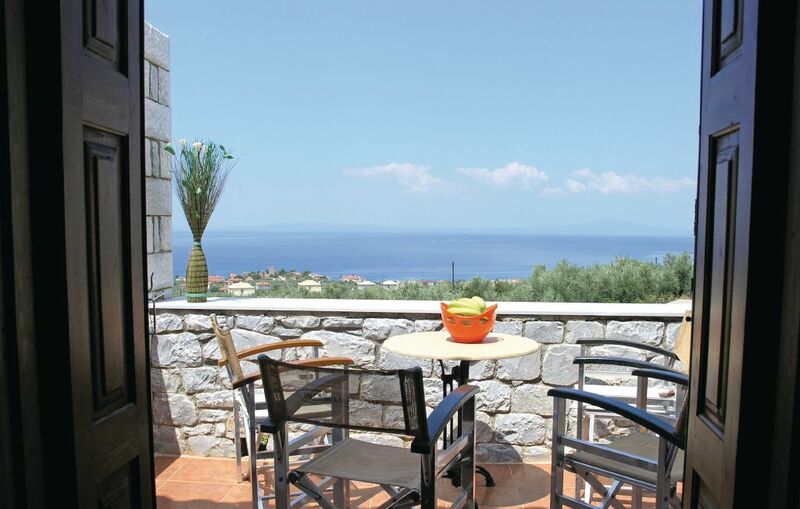 Ideal for a peaceful getaway, this apartment with 2 bedrooms for 4 guests is located with a wonderful view of the Saronic Island of Aegina , surrounded by fruit and olive trees. Accommodation prices start from just £25 pppnt. Flight & car hire additions available. Enquire for more information.